Antibacterial, antiviral and stimulating. 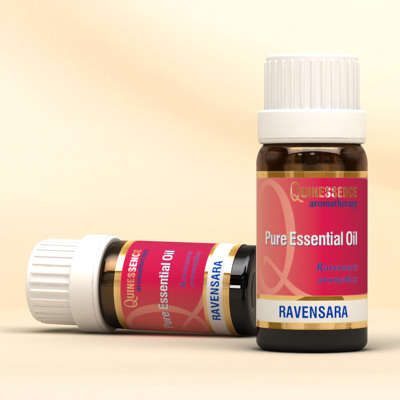 (See also Ravintsara) Obtained from the leaves of a tree native to Madagascar, Ravensara Essential Oil has a soft, sweet, camphoraceous and herbaceous aroma with liquorice-like overtones and woody back notes, although its chemistry and aroma can vary considerably. Inhaling this oil helps clear blocked sinuses, loosen phlegm and catarrh, and ease chesty coughs. The misidentification and confusion of the tree that produces the essential oil previously known as ‘ravensara’ has recently been corrected by botanists, so check that it really is Ravensara Essential Oil that you are looking for, and not ‘Ravintsara’. Please see the information below for further clarification of this issue. Due to the confusion between two different botanical species of trees, there have been two distinct (but chemically quite different) essential oils known as ‘ravensara’ offered by distilleries and traders exporting from Madagascar during the 20th century. The first is obtained from Ravensara aromatica, and the second from Cinnamomum camphora (1,8 Cineole chemotype), and both species belong to the Lauraceae family. These species had been considered identical for many years – even though the chemistry of the oils were clearly different. Now that botanists have finally agreed on the correct identification of the two species and amended their taxonomic descriptions, this has left the oil industry with a bit of a headache. We now know that the essential oil marketed for all these years as ravensara was actually derived from the species finally identified as Cinnamomum camphora, and not as originally believed from Ravensara aromatica. Since the essential oil obtained from R. aromatica is used in industries other than aromatherapy, it was decided by the producers to rename the oil distilled from the leaves of C. camphora to Ravintsara. This does not seem to be a very well thought out designation, but along with most other suppliers we are embracing the change in the hope that eventually this will all become common knowledge! Bottom line - if you are looking for the essential oil you have read about in aromatherapy books and articles, it is Ravintsara that you need, not Ravensara. Limonene, Sabinene, a & b Pinene, Methyl eugenol, Caryophyllene, Methyl chavicol, Linalool, D-3 Carene, 1,8 Cineol, Germacene -D.